Inspiring true stories about champions of climate change action - twelve ordinary people willing to do extraordinary things to help save the planet for future generations. 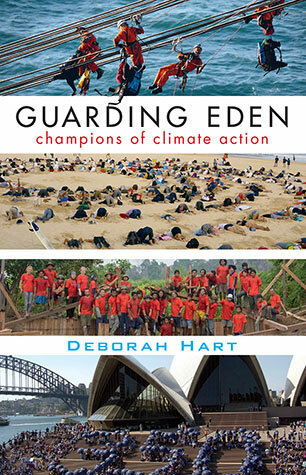 Guarding Eden tells the personal stories of twelve ordinary people who were so concerned about climate change that they altered their lives to do something about it. Some did quiet backroom work in research, drafted submissions or wrote to politicians; others decided to go public, really public - one was part of the team occupying a 160-metre power-plant chimney, one went on a hunger strike publicised around the world, another started the Lock the Gate Alliance. They come from all walks of life: there's a nurse, a musician, an insurance broker, a teacher, a lawyer, a vet. Surprisingly touching, Guarding Eden makes an issue as complex and controversial as climate change feel human and deeply real. Deborah Hart describes herself as 'activist, writer, mother'. Born in Nigeria to Australian parents, she spent most of her early years in the USA. After completing an Arts degree in Melbourne she worked with leading Australian arts organisations, including the National Gallery of Victoria, Opera Australia, Triple R, and Bell Shakespeare. In 2006 Deborah decided to devote more time to her children and to climate activism. She has been a founding member of several not-for-profits: the Climate Emergency Network, Climarte, Quit Coal and most recently, ClimActs, a theatre troupe combining spectacle, humor and direct action in order to highlight the climate-change emergency. Deborah lives in Melbourne with her husband and two sons. This very timely book explores some of the threats to our environment arising from climate change, and showcases the stories of individuals who have taken action to try to make a difference. Some of the environmental threats that Hart describes are alarming and thought provoking, while others are, quite frankly, terrifying. The detail of a specific environmental threat forms the background to a story of a courageous individual whose conviction that they needed to make a difference led them to find a non-violent way to make a stand against it. The overall message of the text is hopeful, in that while it outlines that Australia is facing a raft of environmental problems, it illustrates that the work of individuals can make a difference against the vested interests of corporations or the inaction of governments. This non-fiction text explores a variety of issues of concern to secondary students. In addition to the facts and figures on different environmental problems included, it also provides information that could form the basis of deeper discussions about morals and ethics, and in particular, personal responsibility. There are also a number of elements which would support discussion and investigation into the role of government and the media in environmental issues. The organisation of the text into the separate stories of different individuals means that the text could be approached as a whole, or selected sections could be studied. The text could be used in a range of subjects, but would be particularly suited to English, Humanities or Science. Introducing this text to a Year 9 or 10 class lead to discussion of the environmental issues themselves, and also the impact of structure on the reader, the use of tone, the way individual stories and scientific facts are mixed, and the effect of other authorial choices used to present information which can be confronting and which needs to be taken seriously. I would recommend this text for use with students in Year 9 and 10. It would appeal equally to male and female students, and particularly would engage the rising number of socially aware students with a keen interest in environmental issues. To tell the truth, this book is a little scary. Not because of the actual writing, but it brings home the reality of climate change, and its immediacy. The book in principle is a simple one: case studies of ordinary Australians who have been moved to take action because of the imminent threat of climate change. The people are engaging and their stories are inspiring. What is it that can turn a person from their normal life, into an activist? This book lends itself particularly well to a middle school classroom. It provides a basis for classes in Geography, Science, History or English. There are even activities for individuals and groups suggested at the end of the book. This fits well with a cross curricular focus for teachers and their students, and allows extension activities in letter writing and persuasive writing; climate investigation and likely predicted effects of climate change; oral history, biography and case studies; civics and citizenship discussions; historical sources of climate change and climate disruption; likely effects on demographics, population and economy of climate change; and personal goal setting. Because the case studies are largely self-contained, teachers can use as few, or as many as fit with their unit or lesson plans. The structure of the book can be used to encourage students to read in smaller bites. Because non-fiction is often appealing to boys, teachers can use the individual chapters to match with the interests of individuals in their classrooms. In addition, the case studies can be used as a basis for collaborative and group work, projects and reports and presentations to the rest of the class. I would highly recommend this book to any teacher. The pedagogical opportunities, and simple messages contained in it are inspiring, and very useful. This non-fiction book provides stories about ordinary people who decided to take action against climate change. Each chapter focuses on an individual’s story sprinkled with snippets of background regarding the science behind climate change and related environmental and health concerns surrounding the fossil fuel industry, the Great Barrier Reef and Murray-Darling River, farming livestock and health problems associated with living near mines, to name a few. The primary purpose of the book seems to be to tell the inspiring stories, illustrating what people can do with determination and belief in a cause and the author has achieved this purpose well. Within the school setting, the stories could be used by teachers as a way of incorporating literature into the science classroom and reading aloud relevant chapters to students to stimulate class debate on alternative energy sources, mining and climate change and whether concern for the environment warrants activists breaking the law. Each chapter ends with brief lists of what has been covered in that chapter, which would help teachers quickly identify relevant sections. Unfortunately, this is not an authoritative source of information regarding the science behind the environmental and health issues surrounding climate change. It is an overtly biased book – with the author cherry picking and even misrepresenting scientific information to present her point of view. ‘Science tells us…invest in renewables… (they) can supply all our energy needs’ (page 5) is among the more egregious examples of the latter. The reality is that arguably the world’s most eminent climate scientist and the one who has done more than any other to bring climate change to the world’s attention, Dr James Hansen, has said “suggesting that renewables will let us phase rapidly off fossil fuels in the United States, China, India, or the world as a whole is almost the equivalent of believing in the Easter Bunny and Tooth Fairy.” (Revkin, 2013). That we might need other tools to combat climate change, such as nuclear energy, is not even suggested, let alone examined. There are many climate activists whose visions of climate action do not entirely accord with that presented in this book, but their stories are not told. Some sources of information used by the author have not been included in the reference list, making it difficult for the reader to verify the information, however, it should be noted that the author has encouraged the reader to contact her for references used in the book. This book could be used by teachers to stimulate students’ critical thinking about what constitutes a credible resources by examining the author’s credentials, references used, the purpose in writing the book, accuracy of the information, whether important facts are omitted and whether alternative viewpoints are presented. It could be used to look at ways that statistics can be manipulated to present a particular view point. For example, one activist is quoted (page 106) as saying “Mines now cover 18 times the area they did in 1981. Last year alone  they used more than 88.5 billion litres of Hunter water. “Using figures like this is meaningless if the reader has no idea of the total water volume of the Hunter basin, or of the proportion of land covered by mines in 1981. 18 times a very small number can still be very small. Ironically, starting date selectivity is a common strategy for climate change sceptics seeking to distort and mislead. Similarly, the use of meaninglessly large numbers without context is a typical spin tactic, not redeemed however right the cause. The book could be used with Years 7-12, but if it’s added to a school library it should be balanced by a range of other resources with differing viewpoints. It could also be used as an exemplar of tendentiousness. Revkin, A 2013, Jim Hansen Presses the Climate Case for Nuclear Energy, The New York Times, accessed 3 October 2015, <http://dotearth.blogs.nytimes.com/2013/07/23/jim-hansen-presses-the-climate-case-for-nuclear-energy/?_r=1>. My 13 year old son, on seeing this book on the table, asked, “Why have all those people got their heads buried in the sand?” What followed was the sort of discussion a teacher dreams of in a class room. Such is the power of a cover. The voice of reason, the voice of concern, the voice of the future… or the voice of some redneck greenies? The thing about activists is they always stir the blood – one way or the other. This book is the same. All the emotions and concerns flowed through me as I read it. Each event carried a message. Every action a purpose. An engaging book, Guarding Eden is a collection of twelve bite sized texts which recount protest actions highlighting the need for awareness of climate change. These perspectives are written by various, ordinary people. * In the class room it provides a set of similar texts on a single theme. Ideal for a paired/trio investigation and sharing, a single set of investigations caters for all with the opportunity to re-visit with a different purpose: structure of a recount or narrative; use of evidence to build stories or arguments; the shape of a protest; and so on. A useful discussion starter or spring-board to research. *Please note: These perspectives are explored through the voices of various, ordinary people.